To this I add a resounding ‘Amen!’ As a parent it's tempting to 'just do it yourself'. It's faster, more efficient, yields better results, and is far less frustrating to do a job yourself than it is to teach a child to do it. When it comes to getting kids to work, parents often find themselves resorting to coaxing, nagging, cajoling, bribing, and even bullying in order to get results. In the end, the results are often not what they would have been if you'd just done it yourself. I get it. I've been there. While teaching kids to work can be challenging in the short term, not teaching them to work can be detrimental in the long run. Why Teach Kids to Work? I love the rich imagery that abounds in this simple statement. Think of a young plant, beautiful and full of potential, surrounded by ugly, unwanted weeds. 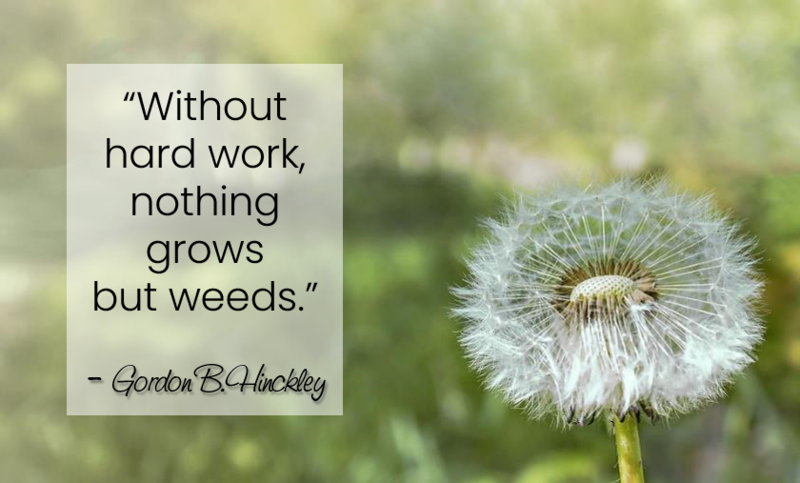 As we all know, weeds (like clutter) are inclined to take over. Soon our young plant will be overwhelmed and possibly even choked by the limiting presence of weeds. The same is true of children. Those who never learn to work or to appreciate the value inherent in working, often become lazy, helpless, slovenly, and entitled. When surrounded by clutter and disorder, a person’s ability to flourish, or even to function effectively, is stifled by the chaos. It goes without saying that none of us wants this for our children. We may, however, unknowingly bring it about through our well-meaning but misguided efforts to do for our children what they can and should do for themselves. On the flip side, teaching kids to work is a great way to help them grow and blossom. Mastering new skills helps children develop confidence in their abilities. It also develops important life skills and strengthens their capacity to problem solve. Furthermore, learning to work instills in children a sense of responsibility for themselves and the things and people around them. As their competence grows, they are able to make meaningful contributions to the upkeep and cleanliness of the home which positively impacts the physical and emotional environment for all who dwell therein. It sounds judge-y to admit it, but all I could think was, "Whose fault is that?" The truth is, it’s not amazing. It's intentional. Teaching kids to work isn’t hard, but it does require planning, and effort, and a little bit of patience. In teaching my own children to work, I developed a 5-step method that has proven effective. I hope you’ll find it useful in teaching your kids as well. As parents we frequently tell our kids to 'go clean your room', but do we ever explain what it means to clean your room? Often the answer is no. We assume they know what we mean, but rarely does a child's vision of 'clean' match up with the parent's vision. If we want our kids to do a job the 'right way', the process begins with taking the time to demonstrate what right looks like. Demonstration can take the form of physically showing a child what needs to be done, but it also involves explanation. Talk your child through the process. If there is an order in which tasks should be completed (i.e. dust before you vacuum), make sure they understand that. If you have a specific way you want a task completed (only use this specific cleanser on the kitchen floor), explain why that is the case. Children are less likely to cut corners and skip steps if they understand the reasoning behind the process. The next step in teaching kids to work is to work with them to accomplish the job. Have them help you do whatever task it is you're trying to teach them. Review whatever steps are involved in the completion of the task and quiz them about what to do and how it's to be done. Let them ask questions and be sure to praise their efforts. You may want to repeat this step of the learning process several times before moving on to step three. At this stage in the process of teaching kids to work, you as the parent get to take a step back. It's time for the child to perform the task on their own. Your job is simply to observe. If they forget a step, ask them about it. If they don't do the task to standard, have them do it over. Work with them to get it right, but allow them to take full responsibility for completing the job. If you were to ask my kids what one phrase they heard most from me growing up, it would probably be this: "Do it nice, or do it twice." It became almost a joke between us over time, but it was also an important lesson. Part of learning to work is embracing the notion that any job worth doing is worth doing well and when you do a job poorly, you frequently have to do it again. When your child has become competent at doing a job, the next step is to have them do the job without supervision. Once the job is complete, the parent comes to inspect. Don't be afraid to make them do it over if they don't do it right. Understanding how to perform to a standard is an important life skill. Praise is also an important part of the learning process as well. Look for specific ways to praise. Instead of saying "Good job", try saying, "This floor feels so smooth under my feet." or "This mirror is so clean I can't find a single spot or smudge." Such praise will not only make your child feel good, it will reinforce two key principles. The first is that you care about the quality of their work and are invested in helping them to succeed. The second is the value inherent in the job - the why behind the work. It's tempting when you're busy simply to ask "Did you...(clean the bathroom, vacuum the stairs, etc.)?" and leave it at that. I have been guilty of this from time to time. However, if you want your kids to succeed, you have to take the time to actually inspect their work and provide feedback. The last step in teaching kids to work is to celebrate their success. This may not seem like an actual step, but it does play an important part in the learning process. Children thrive on praise, and a new skill learned is a cause for celebration. The celebration doesn't have to be elaborate or lengthy. It can be as simple as an impromptu dance party in the living room or a hug combined with some heartfelt praise. 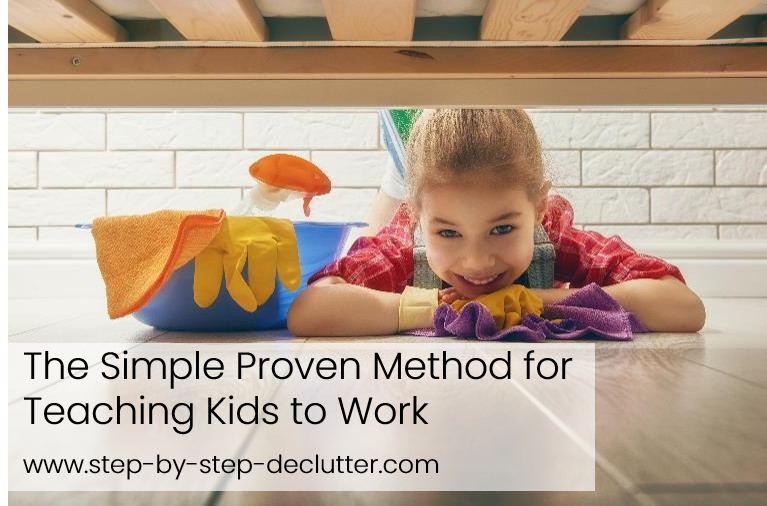 The simple, proven method outlined here for teaching kids to work is effective. It doesn't guarantee your kids will never give you grief about doing their chores. and it will require vigilance on your part to consistently and indefinitely repeat step 4 (inspection). In the end, however, you can be confident knowing you've developed your child's character and taught him or her important life skills. Checklists really helped my kids to master various jobs growing up. 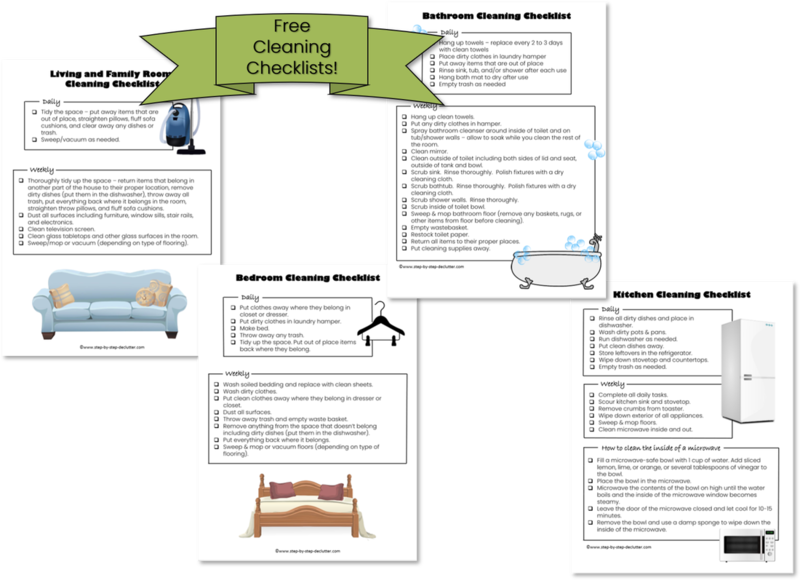 Below you'll find a free printable download that includes four cleaning checklists - one for the bedroom, one for the living/family room, one for the kitchen, and one for the bathroom. The checklists are available as a single download, so with just one click you get four helpful charts! While they were originally designed with kids in mind, they're great for anyone who likes to use checklists to accomplish tasks (that would be me...). Hang a command hook on the inside of a cabinet door or the door to the room where the checklist will be used. Punch a hole in the top of your checklist and hang it from the hook. When it's time to clean the room, the checklist is out of site but easily accessible as a reference. Create a cleaning folder. I recommend using a plastic pocket folder (affiliate link). Place the checklists inside the folder in page protectors. Store the folder with your cleaning supplies. When it's time to clean, whoever is responsible for a given space can pull out the needed page and return it to the folder when the job is completed. 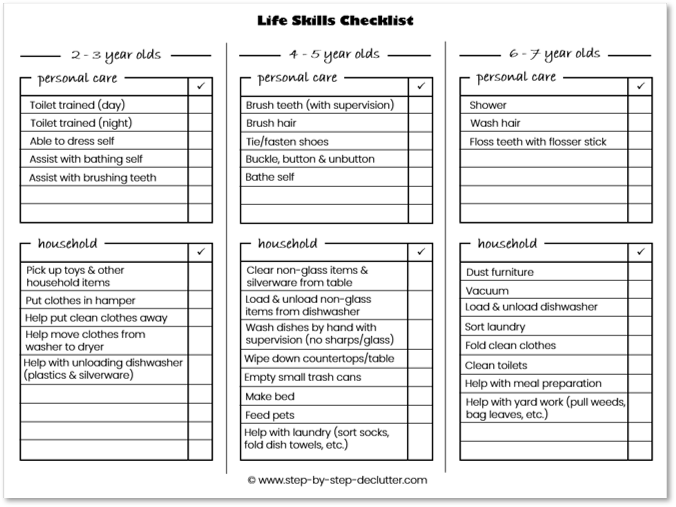 Another really helpful tool as a parent is a life skills checklist. Life skills are abilities that every child should master on their journey to becoming a self-sufficient human being. Knowing what kinds of skills are appropriate for children at different ages can help parents in their efforts to teach their children. They can also make a parent's life easier as children increasingly learn to do for themselves and to contribute in positive ways to the functioning and maintenance of the household. The free Life Skills Checklist included here is based on my own thoughts and experience as a parent. There may be additional skills you think of that are not included on this list. Extra lines are included for adding to the list. ​Teaching kids to work is an ongoing process. It starts when children are small and eager to 'help', and it continues all the way into the teenage years when their enthusiasm for helping has often waned. 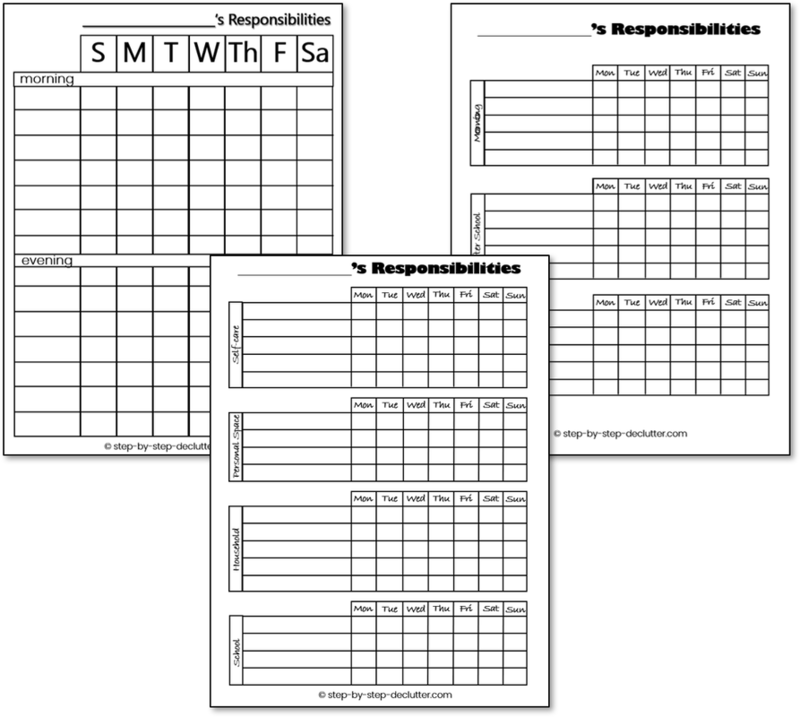 My printable responsibility charts are designed to grow with your kids. There is one for each of the three main phases of childhood: early childhood, the elementary years, and older kids (pre-teens and teens). Each chart is customizable for your specific needs and your child's specific abilities. I have intentionally avoided the use of the term 'chore' chart because the word chore has so many negative connotations. A chore is a dreaded task, something no one wants to do. It is to be avoided and hated. But we don't want our kids to hate and avoid work. We want them to embrace it, learn from it, and grow in it. In contrast, the word 'responsibility' suggests something to be sought after. Responsibilities come with maturity, and all children want to be thought of as mature. If you know other parents who need help teaching their kids to work, please share this page on social media. Please also leave me a comment in the section below so I can thank you personally.